In 2015-16, I researched and experienced activist art in Mexico in entirely unexpected and inspiring ways. I taught this subject in the classroom and was able to see it anew through my students’ point of view. I also participated in Mexican art activism while I was in Oaxaca City, Mexico researching the Oaxaca Commune – a political uprising of 2006, which resurged during its 10th anniversary in the summer of 2016. In Spring 2016 I was supported by a Chancellor’s Graduate Teaching Fellowship to develop and teach Activist Art in Mexico (HAVC 141L), which covered the visual culture of social movements in Mexico from the Mexican Revolution to the present day. Teaching the material to a group of uniquely engaged students was an amazing and humbling learning experience for me. I was blown away by the interactions we had in the classroom and through the course blog, and by the creativity and scope of student projects. I reflect in more detail on this experience in a separate profile, available here. The last unit of my course was on the Oaxaca Commune, which offered a great transition into my summer fieldwork in Oaxaca once the class had ended. Oaxaca’s uprising occurred in summer 2006 in response to state repression of the teacher’s union strike, which had been an annual strike every summer in Oaxaca for three decades. Teachers fought for better resources for students and living wages for teachers. After their strike was violently repressed by then governor Ulises Ruiz Ortiz, the general population got involved and the struggle grew into a broad-based social movement clamoring for a space in which women, indigenous peoples, and the working class could participate more directly in the democratic process. My main goal was to learn more about the visual strategies employed by The Popular Assembly of the Peoples of Oaxaca (APPO), which was the self-organized grassroots group that coordinated the uprising and ensuing social movement. With two previous research trips to Oaxaca under my belt in 2013 and 2015, I arrived with lots of contacts and resources to hit the ground running with my research. I had eight weeks and wanted to make the most of my time. I knew that I wanted to do both archival research and oral history interviews. I had also timed my fieldwork to coincide with the ten-year anniversary of the uprising and wanted to observe the commemorative events that would be taking place. What I had not anticipated was that Oaxaca’s social movement would have a critical resurgence during my time there. While the organizations that had participated and grown out of the movement held commemorative marches for the anniversary, a series of events unfolded that brought this historical study into the present tense. Like every summer, the teacher’s union was holding a strike and sit-in in Oaxaca’s city center. June 14, 2016 was the tenth anniversary of the violent repression suffered by the teacher’s strike and the uprising’s beginning, so there was a tense atmosphere in the city. At the same time, teachers from the union and their supporters were also protesting more recent neoliberal education reforms aimed at decimating the union and standardizing education in ways that would undermine considerations for the sixteen different indigenous communities that exist in Oaxaca. Some of these activists were protesting through the strategy of highway blockades. On June 19th, ten of the protesters were killed in an incident with police about an hour north of Oaxaca City in Nochixtlán. Once again, as in 2006, an act of state violence against the teachers brought on the immediate response of the general public, who began organizing marches, cultural events, and public assembly meetings to address it. In this way, I was able to observe and at times participate in the social movement as events unfolded, which made for a very different relationship to my subject. As a dual practitioner who is also a printmaker, I was excited to lend my help to artist collectives in Oaxaca responding to state repression and misguided education reforms. I worked with one of the most influential and longstanding collectives in Oaxaca City, the Assembly of Revolutionary Artists of Oaxaca (ASARO) to create large woodcut prints for pasting up during a march. I followed and documented the artists as they wheat-pasted their prints on city walls (see image), and I helped them translate their mission statement into English for the task group they formed to respond to the social and political issues threatening their community. We also organized a “cultural brigade” event bringing together artists, musicians, teachers, activists, and the general public to respond to the political crisis with creative projects designed to activate and unite community members. I was able to create relationships with my informants and interlocutors that allowed for the mutual exchange of ideas, the establishment of trust, and a more collaborative format of working. I returned from Oaxaca inspired to begin my dissertation writing process and more convinced than ever that my subject is timely and critically important. As I write this, we are reeling from the results of the 2016 U.S. Presidential election, which affects all of us deeply. But I am also thinking with a heavy heart about the Mexican people, who have been struggling to construct local and grassroots forms of democratic work where they do not see democracy functioning, even as rhetoric promises it exists in their country. This struggle will be all the more challenging with the trickle-down effects of a conservative and racist government to the north. I am deeply committed to continuing my research and collaboration with Oaxacans, to tell the story of their resistance to the English-speaking world, and to hold hope, with them, as with so many people across the globe, for the transformative power of visual strategies that allow us to envision and manifest the world we’d like to see in our future, now. Links: to hear a podcast of a paper on the Oaxaca Commune Lorraine gave in September 2016 at the University of New Mexico, click here. 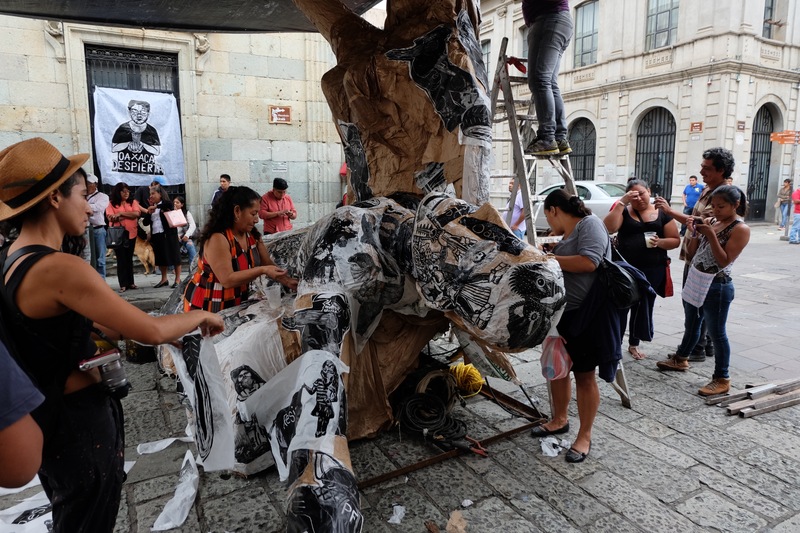 Image caption: Artists, community members, teachers, and activists participate in a collective pieta paper mache sculpture for a "cultural brigade" event in Oaxaca City, Mexico. This event was created in response to the deaths of ten activists on June 19, 2016.